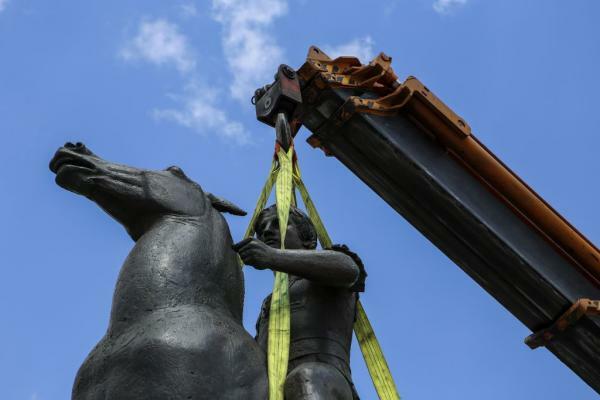 Workers of the Municipality of Athens today quickly placed the equestrian statue on a black granite base – with Alexander’s name on one side and the sculptor’s on the other - after a long period of remodeling of the surrounding area and just before the beginning of the tourist season, as the area is a hub for tourist buses. The statue is 3.45 metres in height and 3.8 metres in length. Alexander bears no arms and is depicted at a very young age. It was placed on display in the National Gallery in 1992 in a Pappas retrospective exhibition – at the start of the Macedonian naming crisis - and not long afterwards it was purchased by the Greek state, when Dora Bakoyannis was serving as culture minister in the government of her father, Konstantinos Mitsotakis.